Through a system of trusts and transfers, you can reduce the overall tax burden associated with the inheritance. For those with substantial assets, more advanced tax planning strategies will be necessary. Regardless of your current wealth, you will likely be able to reduce the taxation of your estate’s assets with the help of an experienced estate planning attorney. By combining the ability to distribute assets with other estate planning tools such as trusts, you can include conditions for each recipient. This ensures that the money you want to give your nephew for college will actually be used for college, even if that is still 10 or 15 years away. As noted, estate planning is for everyone – not just the super-wealthy. Whether it’s avoiding a future family dispute, helping a loved one later in life, or reaching any other goals or objectives, having an estate plan is the best way to protect your interests. In some situations, using a trust can also reduce or eliminate estate taxes, and a trust is especially helpful if you own real property in several states. Placing all of that property into the trust allows your loved ones to avoid opening probate in each of those states. If you are wondering whether you can establish a trust and forego a will, the answer is likely no. 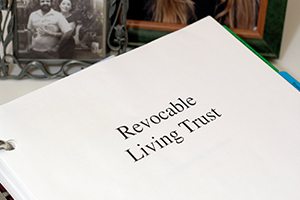 Living trusts and wills pair nicely together, and both are beneficial tools to be included in your estate planning. You are invited to join us for an informative presentation by Jim Ruggiero. Please register online at: www.paolilaw. Call Ruggiero Law Offices today at 610-889-0288 to see which alternative planning method is right for you.